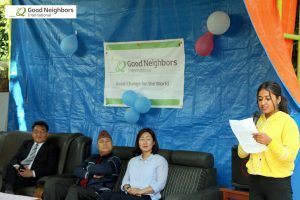 On 28th March 2019, GNI Nepal celebrated its 28th Foundation Day. 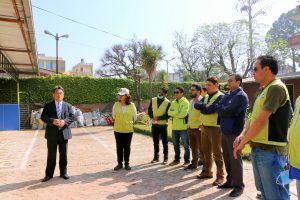 This year’s celebration embodied a greater meaning for us as we invited people who donated land to our infrastructure construction projects and honored them for their gestures of charity. The very same day, our former sponsored children also officially formed an alumni association. 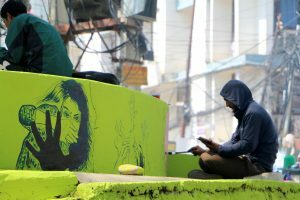 Our staff members engaged in cleaning, painting, and doing artworks in and around the office premises. A group including our Country Director visited three children’s homes and distributed food items and other materials. This joyous day kicked-off with the exchange of good wishes among the staff members, followed by our Hon’ble Country Director, Mr. Min Ho Choi’s brief speech. 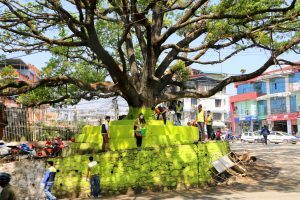 As a continuation to the past three years’ celebrations, we cleaned and painted the Chautara (Communal Resting Place) along with writing slogans against child abuse on the walls. 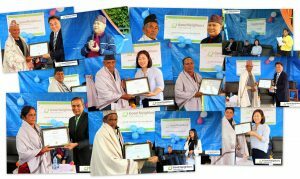 We felicitated twenty-one individuals from ten districts who donated land for building schools, health-posts and other physical infrastructures in GNI Nepal’s working districts. We visited three charity-run children homes sheltering 39 children (30 girls and 9 boys) in total and donated food items. It was also a homecoming for ten of our sponsorship service program graduates who officially assumed their responsibility as memebers of the ‘alumni association’ to reconnect with their counterparts and start good initiatives in future. They also acknowledged the support they received to complete their high school education (ten plus two). Our front-line staff members across thirteen districts also celebrated the day by distributing stationery, foods, personal hygiene materials to orphans, young children, and differently-abled children.